Aksioma – Institute for Contemporary Art Ljubljana is proud to announce “Gazira Babeli: Acting as Aliens”, the first solo exhibition of the avatar artist Gazira Babeli in Slovenia. Internationally renowned for her activity in the digital reality of Second Life, Gazira Babeli is born there in spring 2006. She is a character in the Matrix, something in between the Oracle and Neo. What she does has been either dubbed as bug, virus, performance or art; what we can say about it is that it subverts the traditional notions of space, time, body, identity and behavior we inherited from our daily experience. The show borrows its name from the opening performance, in which Gazira and the audience share the same space and play through material means, in an unprecedented overlap between digital reality and physical reality. The exhibition feature a consistent video documentation of Gazira's previous performances, including 7UP (2008), a clockwork orange of twelve micro-performances made in complicity with Patrick Lichty, in a compulsive mix between slapstick comedy and Fluxus scores. Also on show two brand new works, Prisoners Exercising (2008-2009) and Gaz of the Desert (2007-2009), in which a self standing doll house – be it a desert or a prison – is built around some characters performing a singular, repetitive, sometimes destructive action. Talking to Gazira Babeli: Can We Understand Avatars, or One Another, for That Matter? For Gazira Babeli's Acting as Aliens, native “code artist” Babeli isolates herself in a cubicle, with the only link to the outside world being a video window connected to a webcam into a gallery in Slovenia. Both the subject and object are placed out of context, and are left across the table from one another, left to try to make a connection with one another. What we are left with is the primordial reflection of the Other in each other's eyes, and forced to resolve the matter, what emerges from the dialogue? Talking with an alien requires untold layers of translation through endless social protocols, representations, and local grammars (tools, gestures) as well as metastructures like written languages. For this installation, one might be inclined to give up hope, as Gazira is as opaque as any character on any screen. There are concessions that Gazira has that make the situation hopeful. She will talk to you; she will try to reach out to you. But will you understand one another, or is the entire exercise like trying to understand the idioglossia (secret language) between twins from the outside? Is it like trying to determine whether Schroedinger's Cat  is still alive without opening the box? There are come concessions to this in that all con-versants possess a more or less human form, use anthropomorphized, and share a written language using a latin character set. There are already a myriad of commonalities between you and Gazira that it seems that one may not need a Rosetta Stone. If you draw a cat, she might know it is a cat. If you wave, she may wave back. There is already some groundwork in place when one includes the similarity of language devices, embodied form, and so on. But recent discoveries in animal cognition reveal that the gulf between us is wider than we ever imagined. Throughout the 1990's Irene Pepperberg  has been doing groundbreaking work in the area of animal cognition with her gray parrot Alex. She learned that Alex was able to understand the concept of zero, which is hard for some children, and express fear of predators outside the house even with the blinds closed, which reveals abstract thought. In addition, Temple Grandin's work  with animal consciousness and autism in her design of more humane slaughterhouses proves how little human beings understand about the consciousness of other beings, or one another, for that matter. You know, when I look into my little Siamese cat's eyes, I know there's a thought process there. I have learned her clicks and trills, and although we are of a common culture, but have different languages and different types of consciousness, we have learned to translate, and we have an understanding. But the fact that after tens of thousands of years of civilized development, we have only now begun to learn that other beings on our earth think and feel is nothing less than the realization that African natives were indeed human, and their art entered art museums rather than natural history museums. As a species, humanity has a long way to go. And when confronting an obviously advanced species as Gazira (Homo Virtualis), will she consider you human? I know her well enough to think that she will. Returning to the black room, the negotiation continues. Gazira shows a stick figure drawing of a boy under a sun, the person on the other side of the screen, shows a picture of a cat. An anvil falls from the sky inside the room. What was that? Nothing? Don't worry... Let's keep talking. Text written for the exhibition Gazira Babeli: “ACTING AS ALIENS”, Galerija Kapelica, Ljubljana, Slovenia, November 3 – 15, 2009. Curated by Domenico Quaranta. For more infos, cfr. Wikipedia, http://en.wikipedia.org/wiki/Irene_Pepperberg (last visited October 26, 2009). For more infos, cfr. Wikipedia, http://en.wikipedia.org/wiki/Temple_Grandin (last visited October 26, 2009). Gazira Babeli has been living and working as an artist, performer and film-maker in Second Life since spring 2006. In September 2006 she published records of a number of “non authorized performances” on the web, capturing the attention of art critics and artists. Artists above all. 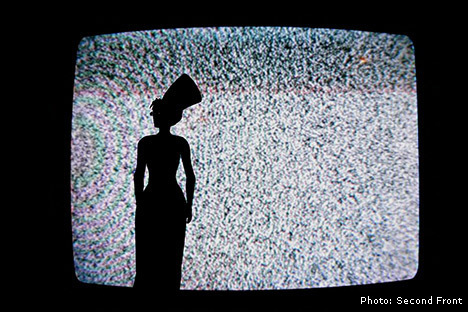 She then became part of Second Front, an international group of artists/performers dedicated to the formal, aesthetic, cultural and social exploration of a reality dubbed “virtual”. She was involved in the launch of the first native artistic community in Second Life: Odyssey. In April 2007, after filming the movie/performance Gaz of The Desert, she staged an exhibition entitled [Collateral Damage]. Gazira Babeli has taken part in various festivals and events outside Second Life, including: Peam2006 (Pescara), DEAF07 (Rotterdam), Fabio Paris Art Gallery (Brescia), iMAL (Brussels), PERFORMA 07 NYC (with Second Front), DAM Gallery (Berlin). Most of Gazira Babeli's works are currently archived in the Locusolus region of Second Life. Patrick Lichty is a conceptually-based artist, writer, curator, and activist. He has been exhibiting internationally since 1990, and is best known for his 3D animations with the activist group, The Yes Men, and as Editor in-Chief of Intelligent Agent Magazine in NYC. Venues in which Lichty has been involved with solo and collaborative works include the Whitney & Turin Biennials, Maribor Triennial, Performa Performance Biennial, Ars Electronica, and the International Symposium on the Electronic Arts (ISEA). He is currently a member of the faculty of the Interactive Art & Media Department of Columbia College, Chicago. Domenico Quaranta is a contemporary art critic and curator based in Italy. PHD, he lectures internationally and teaches at the Accademia di Brera in Milan. With a specific interest in digital culture, Domenico regularly writes for Flash Art magazine. His first book titled, NET ART 1994-1998: La vicenda di Äda'web was published in 2004; he also co-edited, with Matteo Bittanti, GameScenes. Art in the Age of Videogames (Milan, October 2006) and edited or contributed to many other books. As a curator, he organized several exhibitions in Europe, including: Connessioni Leggendarie. Net.art 1995-2005 (Milan 2005); GameScenes (Turin 2005); Radical Software (Turin 2006); Holy Fire. Art of the Digital Age (Bruxelles 2008); For God’s Sake! (Nova Gorica, 2008); RE:akt! | Reconstruction, Re-enactment, Re-reporting (Bucharest – Ljubljana – Rijeka, 2009); Expanded Box 2009 (ARCO Art Fair, Madrid 2009); Hyperlucid (Prague Biennal, Prague 2009). Gazira Babeli is an artist who lives and works in the virtual world of Second Life, a 3D online universe entirely constructed and possessed by its residents. Gazira Babeli has created a vast body of works which address the world she lives in, and which have lent her such a solid, recognizable image that she has become a household name in Second Life. She acts like a virus, unleashing earthquakes, tornados and storms of images, deforming the bodies of other residents and constructing metaphorical machines; a capricious deity, she herself is a work of art, a "constructed identity" which ably generates its own legends. This monographic publication tells her story, and presents and analyzes the most significant areas of her work, with contributions from writers such as Mario Gerosa and Domenico Quaranta, and Americans Patrick Lichty and Alan Sondheim.